Cut the onion in two, grate one half and finely chop the other half. Keep both separate. Chop the spring onions and set aside. To make the meatballs, put the mincemeat in a mixing bowl. Using a garlic press, mash the garlic into the mince, add the grated onion, salt and black pepper. Also add 2 tablespoons of oil to the mix then, using your hands, massage together all the elements and form the meatballs. Put the balls in a sauce pan, cover and place on high heat for 5 minutes. This will extract the water from the meat and when there is no more liquid coming out of it, the meat will start to fry and brown in its own fat. Just make sure that it browns on all sides. Once this is done, remove the meat from the pan and set aside to rest. Without rinsing the sauce pan, fry the chopped onions in the meat residues. 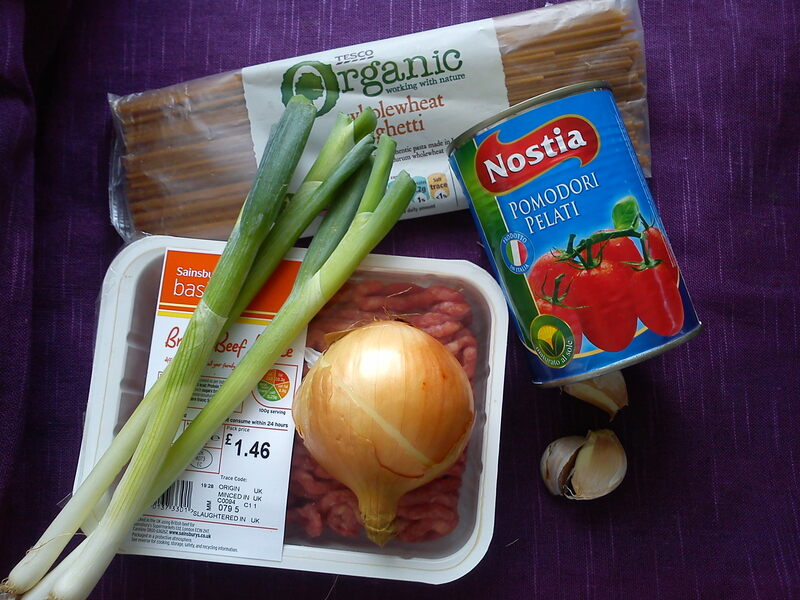 Brown for 2 – 3 minutes, add the spring onions and the tomato. Season with salt and pepper, then, cover for 10 minutes the time for the juice from the tomato to evaporate. Now, put the meat balls back in the sauce with a tablespoon of ketchup and 100ml water, then cover for another 10 minutes. In the meantime, cook the spaghetti according to the instructions on the package.